The Micro Metal Muff pedal by Electro Harmonix is the smaller sibling of the Metal Muff family. Encased in a sturdy, compact die-cast shell, it is built to withstand plenty of use both onstage or in the studio. The Micro Metal Muff has an easy-to-use interface with simple controls and can be easily engaged or disengaged using the footswitch. This pedal also features a Top Boost switch to further enhance your range of distortion tones. 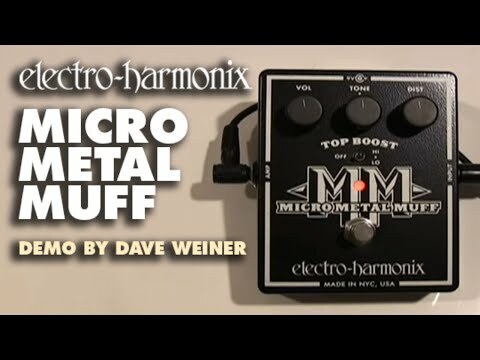 Whatever metal sound you want to create, the Micro Metal Muff is the ideal pedal. With just three controls you can shape your sound entirely. The Tone dial gives you wonderful scooped mids if turned to the left, and offers you 15dB of cut and boost control to provide ultimate midrange. The pedal also features a Top Boost switch, which you can choose to be Hi or Lo (or Off), depending on whether you need those higher frequency tones or not. The Micro Metal Muff is suitable for playing a wide range of hard rock genres and sub genres thanks to its high distortion rate. This is even better if you plan to use it onstage or in a band. The Micro Metal Muff can be powered by a 9V battery or by an optional 96DC-200BI power supply.